With the Korean wave hitting local shores, AIA has become a major sponsor of a K-pop concert to connect with young people by providing experience with K-pop concert. The concert themed “Be real. Love it. Live it”, features Beast, 4Minute and G.NA live at Stadium Putra Bukit Jalil on 27 June 2013. The concert is also a platform for AIA Malaysia employees, agency members, customers and business partners to come together as one to celebrate its 65th anniversary. 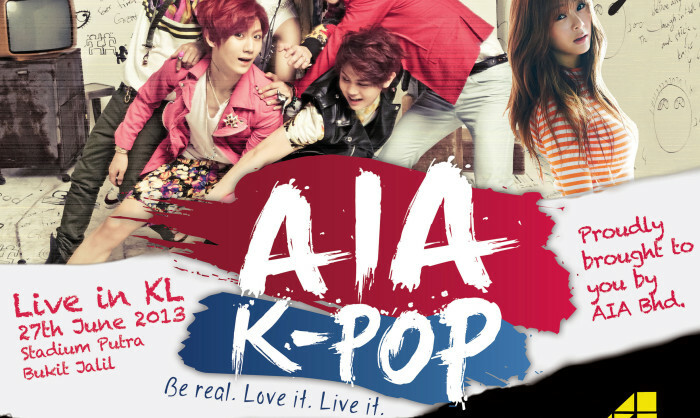 Prior to the concert, AIA launched the official K-pop site www.aiakpop.com.my to update K-Pop fans on the latest concert news, photos and videos of their favourite K-pop artistes. Besides that, AIA will also be organising contests and events to enable fans to win concert tickets and exclusive AIA-K-pop merchandise. Among other brands that have leveraged on the K-pop phenomenon is mobile messenger service provider LINE, which engaged Korean star Siwon Choi in its campaign. Recently, Malaysia Airlines became the official airlines and Resorts World Genting as the official venue for K-Pop Dream Concert at the Arena of Stars on 23 May 2013. Earlier this year, Samsung brought in K-pop artistes to perform at the Samsung Galaxy 27thGolden Disk Awards (GDA) at Sepang International Circuit. The communications will be rolled out through advertising, digital and social media, OOH, PR and event activations across six mark..